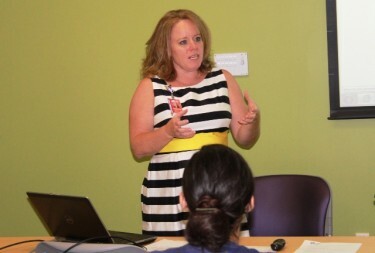 Christina Ryan-Scott, a student in GCU’s doctor of nursing practice program, trains new nurses at Phoenix Children’s Hospital. Over the course of Christina Ryan-Scott’s 26 years in nursing, career opportunities have knocked every so often, and she has always answered. That happened again this spring for Ryan-Scott, who enrolled in Grand Canyon University’s new doctor of nursing practice and soon will begin her third course. Dr. Anne McNamara, dean of GCU’s College of Nursing and Health Care Professions, heard from numerous nurses asking for a path to advance their careers and improve patient care before moving forward with the DNP. It was launched in March with 30 students, and 60 more will start class Thursday. The fully online program differs from many of the other 240-plus DNP programs in the United States in that it is training learners to translate research into innovative health-care solutions, while integrating Christian perspectives, said Dr. Melanie Logue, DNP program chair. Those beliefs, values and guiding principles are presented in ways that encourage students to think about how these worldviews impact their decisions in their practices. The two-year, 36-credit DNP, designed for advance-practice nurses and nursing leaders, such as nurse managers in hospitals, offers 12 eight-week courses. Topics range from population management and data analysis to emerging areas of human health and applied science in advanced nursing. Logue, formerly an assistant professor in GCU’s family nurse practitioner program, has a dual Ph.D. and doctor of nursing practice from the University of Arizona’s College of Nursing. There, she was a clinical assistant professor and an academic fellow in the Health Outcomes and Practice Effectiveness Research Center. That’s part of what Ryan-Scott, who has a bachelor’s in nursing and a master’s in nursing administration, likes best. Ryan-Scott wasn’t certain a fully online program would work for her, but she has been impressed with GCU’s organization of resources and information and responsiveness to questions. “You have to learn to navigate the different portals, but it’s all there and easy to figure out,” she said. Recognizing the importance of integrating online learners into the University, Logue noted they are part of the Doctoral Community Network, a virtual workspace that allows all communications and files to be easily accessed over an extended research period. The platform enables them to connect with mentors and other students based on their geographic locations and interests. Ryan-Scott, who plans to graduate in April 2016, believes her employer, one of the largest children’s hospitals in the country, will benefit from her new degree. The DNP program puts GCU in a proactive position as national health care evolves under the Affordable Care Act, McNamara said. Additionally, the American Association of Colleges of Nursing has called for the adoption by 2015 of the DNP as required preparation for advanced practice nursing. Additionally, the Institute of Medicine and other organizations have called for programs that train health professionals to be “re-conceptualized” and to double the number of DNP-credentialed individuals by 2020. Currently, only about 31,000 nurses in the United States — 1 percent of the total registered — are doctoral-prepared, McNamara said. GCU’s program is expected to draw an additional 120 students later this year and 320 more in 2015. DNP learners must identify a practice-based issue that will be the basis of their final scholarly project, with the goal of improved population outcomes. Ryan-Scott’s project will be on error prevention in nursing. “It will alert nurses to be more aware of what situations are occurring that could potentially cause errors,” she said. Contact Janie Magruder at 602.639.8018 or janie.magruder@gcu.edu.